The amount of evidence proving that the CIA is running drugs is overwhelming. The notion of it being ignored, like all the evidence presented in this section further overwhelming. Some of the most creditable evidence of the CIA running drugs is contained in the disclosures by Mike Ruppert. Mikes evidence is relative for the public to incite further action at the federal level. Please SUPPORT Mike directly, Panacea will help where and when it can, Mike is an independent researcher and needs public support to survive. His knowledge is totally not for profit. Please sign the petitions to get these issues addressed by Panacea at the federal level for public security. This Introduction is taken from his site in the about column. Quote: WHO IS MICHAEL C. RUPPERT? The 1981 Herald Examiner Stories – Two consecutive front page stories got it mostly right but confirmed that Ruppert had stumbled on illegal covert operations: available on the site "Mike Ruppert is a one man crusade trying to expose America's bogus war on drugs. From the time we met on the campaign trail in 1992 while filming THE LAST PARTY, through his challenge to John Deutch, Mike Ruppert has been on the front line trying to get the story out." - Marc Levin, - Emmy award winning Director of PBS's The Secret Government, THE LAST PARTY and Producer of Bill Moyers' 1998 series on Addiction. Mike is also the publisher/editor of From The Wilderness, a newsletter read in more than 50 countries around the world. Its subscribers include 60-plus members of the US congress, professors at more than 40 universities around the world, and major business and economic leaders. 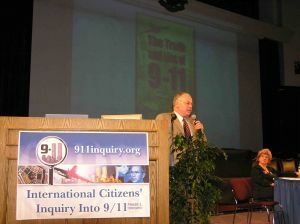 Since 9/11 Mike has been in demand as a university lecturer and has spoken on Peak Oil and 9/11 in nine countries. Recently, at the request of Congresswoman Cynthia McKinney, he served as an official questioner during a Congressional briefing looking into unanswered questions and the unaddressed flaws of the Keane Commission report. Having concluded that the US government and markets will be useless in preparing American citizens for the coming crisis, Mike's current focus is on individual and community preparedness for the coming challenges and the development of a reliable news service to quickly identify and track breaking developments around the world. 9/11 Truth: "Denial Stops Here - From 9/11 to Peak Oil and Beyond"